I’ve been meaning to recap our trip to Taiwan for a while now. After ringing in the New Year in Hong Kong, Dan and I decided to spend our first week of 2013 in Taiwan. I’ve always wanted to go to Taiwan because my dad was born and raised there. I recently did a food post about Hong Kong. What I didn’t mention in the post is how amazing the food is in Hong Kong’s airport. They have the best airport food that I have ever experienced. I was really excited to discover that they had a Sam’s Congee Delight in our terminal. I had a very full and delicious breakfast. Apparently I didn’t take any pictures of it, but from what I remember I had a bowl of shredded pork and thousand year old egg congee, some ha gow (shrimp dumplings) and a spring roll. Meanwhile, Dan opted for McDonald’s (Dan loves McDonald’s and it was very cheap in Hong Kong. My cousin later told us that they also do delivery. What a dangerous combination!). 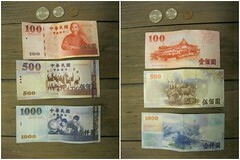 Some of our New Taiwan dollars. 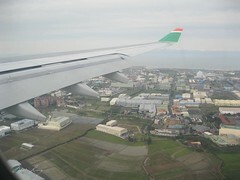 We flew Eva Air to Taipei. 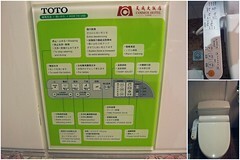 My parents had recently visited Taiwan as well and raved about how wonderful Eva Air was, so we had to try it out. It was a pretty good airline with pleasant staff. They even played classical music as we got on the plane. 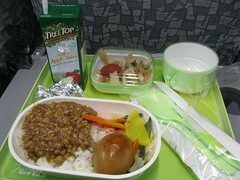 What I loved the most about Eva Air was how much food they served us. A flight from Hong Kong to Taipei isn’t very long (about 2.5 hours). Even though the flight is so short they still serve you a full complimentary meal. They were also incredibly efficient, clearing our trays right when we finished our food and bringing us tea to enjoy afterwards. It was amazing! Much better than the “Rocketchips” that I’ve been fed on 6 hour flights in Canada (Are you listening Air Canada?). The view from Eva Air. My meal on our flight to Taiwan. The flight was so quick, that I barely had time to watch a movie and eat all of my food before we landed. 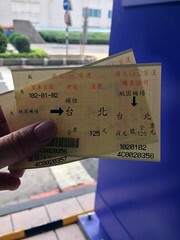 Upon landing, Dan and I bought bus tickets and took a bus to Taipei Station. I soon forgot that Dan doesn’t speak Mandarin, so after a while I finally started telling him what people were saying. I was relieved to discover that I understood what everybody was saying and that my Mandarin was still good enough to get around (it’s gotten worse since marrying Dan since I don’t speak it much anymore. Though I still watch a lot of Mandarin shows like Voice of China and Taiwan dramas. I also speak Mandarin to our dog). Since my dad’s family is from Taiwan I’ve always found the Taiwan Mandarin accent very comforting, so that also helped. 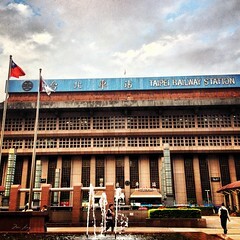 Taipei Station. It was huge! 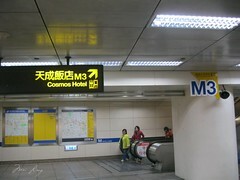 It also connects to the MRT as Taipei Main Station. 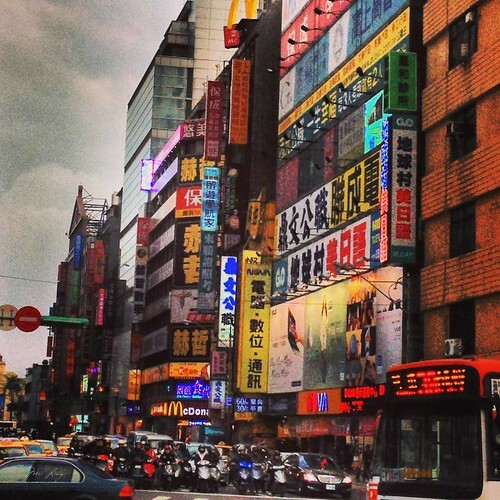 After arriving at Taipei Station we wandered around until we found the exit to our hotel. 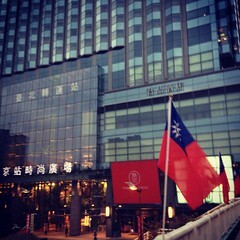 My parents had wanted to stay at the Cosmos Hotel when they were in Taipei but it had been booked up. 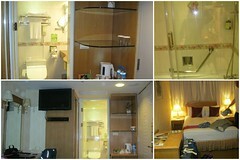 So we ended up staying there since they have their own exit out of Taipei Station! It made it very convenient and easy to find. Check in was smooth and our room was small but comfortable. We were intrigued by the instructions to use the toilet. It had so many functions! Dan eventually figured out how to set it so that the toilet seat was heated. Our hotel had its own exit out of Taipei Station. Our room at the Cosmos Hotel. Small but comfortable. After settling in we took a short walk to familiarize ourselves with the area. We ended up in Q Square Mall where we explored the fashion and electronics stores before heading to the food court. We tried food from Botejyu for dinner before heading back to the hotel. I looked up Botejyu later and found out that they’re a Japanese restaurant that was founded in 1946. We shared one of their Okonomiyaki dishes. It was ok. We were hungry so we enjoyed it. 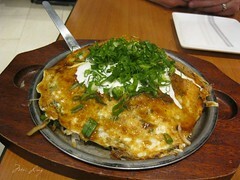 Our Okonomiyaki dish from Botejyu. I don’t know how to describe it. It had a pancake at the bottom, soba noodles inside, I think cheese and different types of meat. It reminded me of a Japanese lasagne. And that was our first day in Taipei. Thanks! I had originally hoped to visit some temples but I lost a day when I got sick (some sort of stomach flu or food poisoning. It wasn’t pretty) so we didn’t make it to any. Your post about them makes me want to go back and check them out though!